making a final decision has been ridiculously tough. to say we've agonized over this would be an understatement. it was a challenge to whittle the field down to FIVE but then to select but 1 GRAND WINNER proved nearly impossible. we love each of these couples ~ and we love them for different reasons. to all of our couples . . .
we want to reach out + hug you . . . in fact, we're ready to move in with you! not only do we feel like we know YOU, we also feel like we know your family + your friends thanks to the many blog comments + emails directed or way. we'd really love to document your wedding ~ we just want to be there with cameras to our eyes, watching + recording those looks, those laughs, that love. we want to watch your MOMS, your DADS! (their emails + blog comments were especially compelling.) and we want to see YOU seeing each other for the first time that day, capturing it all in a way that will bring memories rushing back when you hold these pictures in 20, 30 years. CONGRATULATIONS, magda + jan. You are our GRAND WINNERS. it's the element of TRANSCENDENCE that kept our hearts coming back to magda + jan.
"fought the Nazis for a free Warsaw, was wounded and taken prisoner. 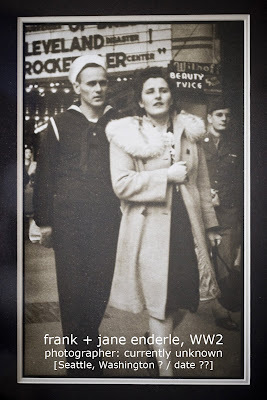 Later liberated by American forces, he fought with the British to the end of the war and started a new life in Canada." "was annexed by the Soviets: she was deported to Siberia, escaped to India and finally made her way to Canada. During the Cold War, returning to Poland, or even re-establishing strong ties was unthinkable. Nonetheless, the family kept strong Polish traditions." The chance for jan's family to return to Poland, after nearly 60 years abroad ~ to witness his marriage to a woman born + raised in Poland to whom he'll be wed in the same church were his grandparents were married ~ must be powerful indeed, not only for past generations, but for the generations yet to come. Ultimately, the contest and your stories inspired us to think about when we make pictures, who are we making them for? in part yes, we're making pictures of and for brides, grooms because the pictures are how you remember. but we're also making pictures for generations yet to come . . .
the chance to document jan + magda's wedding is thrilling in part because their story starts many many years before they were born. 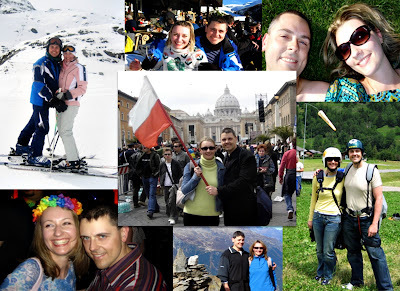 we love not only how much jan + magda mean to each other (he was so smitten he learned polish for her!) but what their union means to generations of their families. we envision wedding photos that exalt in not only the couple's relationship, but in their families' lives and histories. Pictures are a family's heirlooms. someday amy hopes to take a week-long working vacation and identify the photographer who created this work..... note the clever angle -- see the "beauty/service" sign over jane's left shoulder? 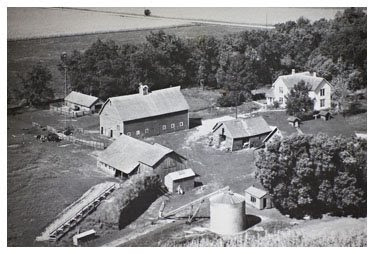 one of kim's favorite family photographs is of the farm where her father grew up. The house and outbuildings no longer exist; these were torn down when smaller family farms were consolidated into larger farms. "I love imagining my dad here . . . discovering that his calf had survived the tornado even though the barn was in ruins, reading "The Black Stallion," getting trapped under a large sack of potatoes, eating my grandma's homemade chocolate cake." and so this contest has taken us many places: we've literally laughed out loud AND cried, too (being moved by a good love story should be a pre-requisite, we think, for wedding photographers!) and we've searched our hearts and our homes and our own histories as to why pictures matter so very much. after much contemplation, what we've settled on is a story that doesn't start with a couple, but that starts, in fact, many years before they were born. we anxiously await the opportunity to help tell the story of this next chapter.